These little treats were nothing if not quick and easy. 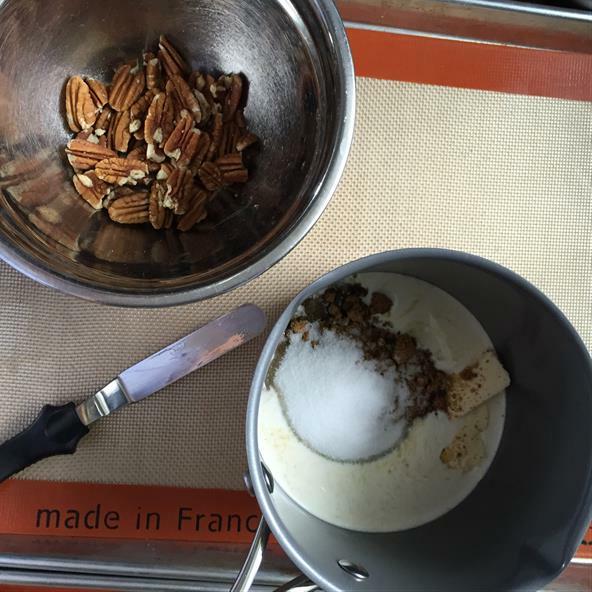 Dump all of the ingredients except the vanilla and nuts into a pot, then caramelize it. While I was standing over the pot of molten sugar, I had it occur to me that it was a rather ridiculous thing to be doing on a really hot day (for May in Southern Ontario – it’s all relative). I’ve been doing a bit of introspection lately, because I’m about to make a significant career change, and I’m spending some time thinking about what it is I like about what I do and why I enjoy the things I enjoy doing. For work, I really like solving problems. I think part of why I enjoy that is for a similar reason. The scale of reactions are different, but it’s a range from “Ugh, you’re telling me I have to go through how many steps to do my job, now?” to “Oh, wow, I had no idea you could make that work. My job is going to be so much easier now.” I think what gets me out of bed in the morning is an opportunity to create an experience for people I care about. And I actually care about most people, oddly enough. In my personal life, every now and then, I’ll plan an event and it’s not always because it’s something I really want to do, but because it’s something I think the people I care about will enjoy. As an example, on our trip to Italy, I planned a visit to the home of Ferrari, in Modena, and a stop on the way at the Pagani Factory in Castelfranco Emilia. We got to tour both the original factory and the one that they were in the process of moving into at the time. I didn’t plan it because I like fast cars, but because I knew Jay would remember it forever. Anyway, once you’ve finished your navel gazing, and the caramel is up to temperature, pour it over the chopped pecans, let it cool, stir in the vanilla, then shape it into something round-ish on the silpat lined baking sheets. 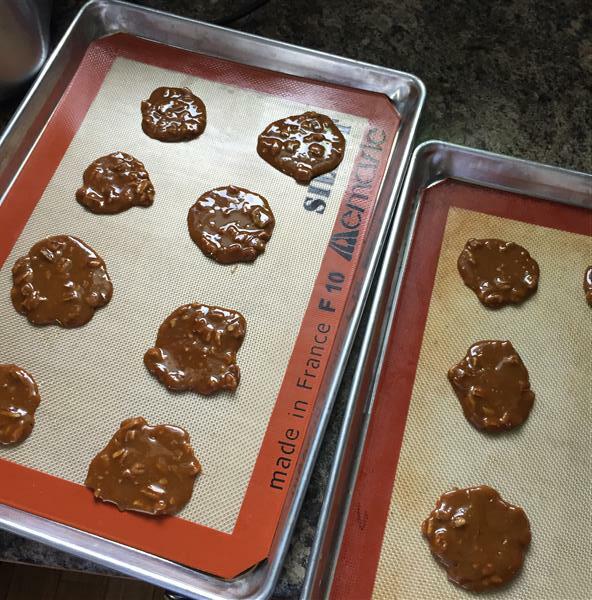 Posted on May 31, 2016 by KristinaPosted in The Baking BibleTagged caramel, pecan. What a kick to be able to pick up an instrument and play for your own enjoyment. How lucky for your family and friends to have you in their lives. Giving unconditionally is an art these days. As turtle candy is one of my favorite, I am now looking forward to making these, if I don’t melt first during the current inferno. Good luck with your job change. The job change is a great opportunity. I’ll post some details as it transitions from (solid) plan into reality in a couple of weeks. Those caramels are powerful stuff obviously – maybe they’ll help me work out my life too? I’d better get cracking on them. Good luck with the job change – hope it turns out well. All I think I (might)have worked out is some vague notion of what motivates me. The real challenge is figuring out how to ensure that what I do every day aligns with that! Work in progress! How amazing your story to bring you back to play! also, a wise man once told me ” If money wasn’t an issue what would you like to do with your time”? He continued ” and once you do find it make it your living”.